This 1977 Sierra Classic was purchased new by my grandfather in December 1976. He special ordered it with a number of options including a 400 cu.in. V8 engine (RPO LF4), dual gas tanks (RPO NL2), and a fleetside bed (RPO E63) with a wood floor (RPO E81). Dad got the truck when Grandpa passed away in 1988. 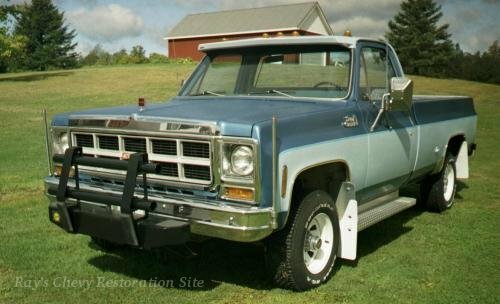 It was getting a bit rusty so Dad replaced the fenders, doors, and bedsides with new GM parts in 1989 and had the truck re-painted. He had to go with an aftermarket LH bedside since the GM one for dual tanks with the round '73-'78 style gas filler hole had been discontinued. 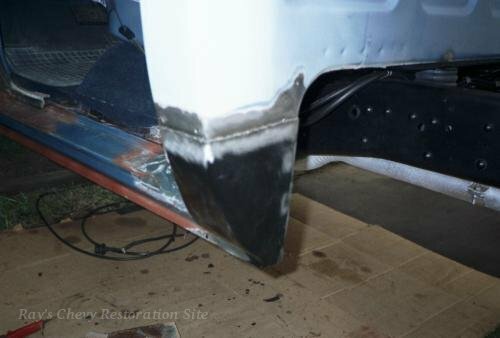 The aluminum side trim that originally separated the two tone paint was in poor condition so it was left off when the truck was re-painted. Dad also put on a set of headlight bezels and lower grille trim from a '79, amber parking/turn signal lenses from a '73 or '74, a Lund visor, and a set of running boards. The photo above was taken in 2001 before we began the restoration. As can be seen in the photo, the paint was getting a bit faded and dull (especially on the hood). 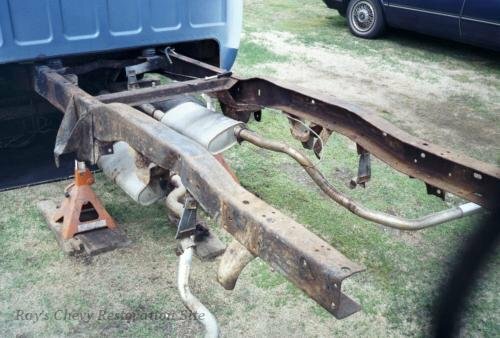 The aftermarket LH bedside had also started rusting out above the wheelwell and that area had been patched/re-painted in the mid 1990's. The driver side cab corner (which was still original) was starting to show some rust bubbles under the paint as well. 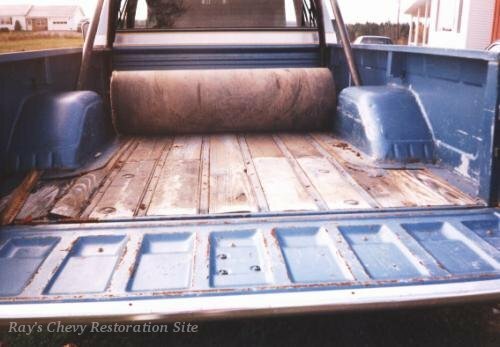 One of the areas that needed the most restoration work was the wood bed floor. It was getting quite rotten and had earlier been patched in a few sections. The steel flanges that mate the wood up to the bedsides and inner wheel tubs were also getting rusty. We stripped the rear half of the frame down in preparation for sandblasting. The rear spring hangers and the rear crossmember were heavily rusted so we removed them. The rear spring hangers were replaced with new GM parts and the crossmember was replaced with a good used one off a parts truck. Here is the rear half of the frame after a couple coats of semi-gloss black paint. The rear axle housing was also sandblasted and painted. 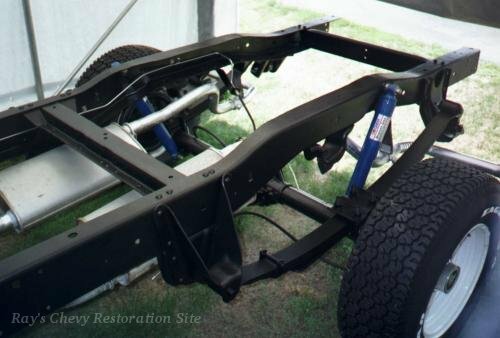 The leaf springs, shocks, and brake lines are all new. We also refurbished the rear brakes with new drums, shoes, wheel cylinders, and hardware. The cab was still in good condition for a truck this age. The passenger side rocker panel and cab corner are original and were not showing any signs of rust. 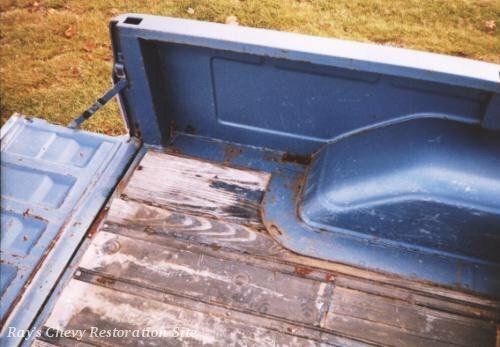 The driver side rocker panel and cab floor had already been replaced when dad fixed the truck up back in 1989. The original driver side cab corner was starting to get a little rusty at the bottom so I replaced it. The inner cab corner was also getting rusty so I replaced that too.